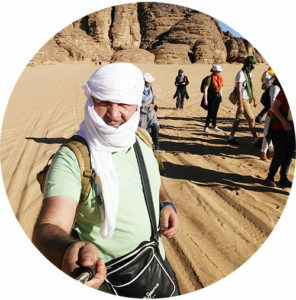 If you want to make a travel tour in the Sahara, you can do it with certified local guides. They will make you discover the desert, its sublime landscapes in 4×4. If you like to travel, trek, live unique human adventures in a group, book now your circuit in the Sahara. You can choose your departure date and your return date. The nights under the beautiful stars and the majestic Milky Way, the overlapping Admer dunes, the unique sunsets in the world, the gigantic plateaux rising in front of you, the dromedaries by the side of the roads or between dunes, the beautiful gueltas… this is beautiful, magical! 5 days, 7 days or 15 days of a tour package in the Sahara, it’s a pure adventure, a holiday of pure happiness! You will get up in the morning with the beauty of the desert that surrounds you. You will make your circuit in the wonderful region of Tassili n’Ajjer, near the oasis Djanet (in the south-east of Algeria) or in the red Tadrart (south of Djanet). You make your trip according to your dates. The season of Sahara travel tours excursions starts in September and ends in March / April. Visit the Sahara accompanied by our drivers of 4×4 and a cooks! Several 4×4 are at your disposal to spend an unforgettable trip! There are many places to visit! They are all different and all beautiful! Tilalen, Tikoubawin, Essendilen, Dider, Iherir, Djanet, Tin Merzouga of the red Tadrart… and many other places. Every day is unique! You can not wait to discover the Sahara? Ask for a parsonalized quotation! Are you ready for a unique adventure? Prepare your hiking shoes, your water bottle, your camera… and book your tour with us. Places limited to 20 people. Discover the beauty of the Sahara! A question to ask us?